For a country as large and in a state of rapid development as India, keeping up with its growing energy requirements is a huge challenge. In this context, it’s commendable that India is investing heavily enough in renewable energy to become the second largest consumer among developing nations, according to a report from BloombergNEF. The outlet’s Climatescope survey ranks India just after Chile on the global leaderboard of developing nations, and ahead of Jordon, Brazil, and Rwanda. Too bad its efforts are marred by its incumbent coal sector. The report assessed 103 developing countries on the basis of several indicators such as clean energy policies, power sector structures, infrastructure development rate, installed capacities, and emissions. This is commendable progress by India considering that it has jumped three spots from its last year’s position at #5. China, meanwhile has slipped six spots to rank #7 this year, from being the leading nation a year ago. This shows that India has taken its goal announced in the Paris Climate Accords of reaching 175 GW of clean energy generation by March 2022 seriously. And so far, India has completed nearly 40 percent of the task, installing infrastructure to produce 71 GW as of June 2018. 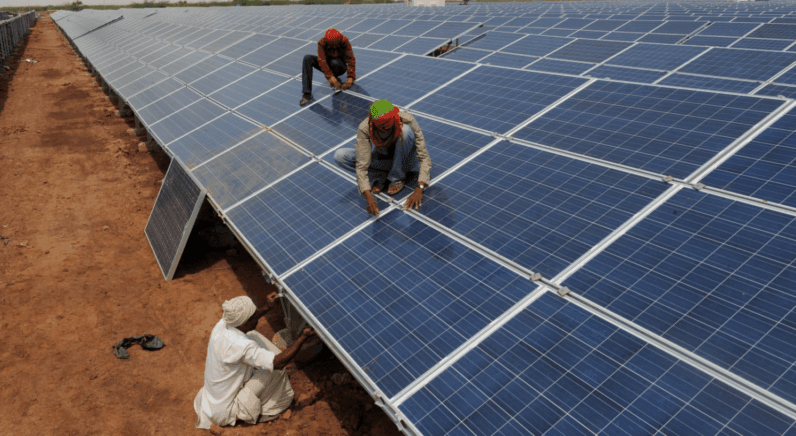 India’s renewables auctioned capacity has also increased by 68 percent, and investment in clean energy – mostly solar – has grown to $7.4 billion in the first half of 2018 – pointing at a massive increase in interest in this sector over the past year. However, whether you call this progress depends on what point in the trend line you are looking at. While the report notes that the number of India’s renewable energy installations surpassed those of coal power plants for the first time in 2017, it also indicates that India is still nowhere near being done – unlike several countries which have vowed to end coal within an announced deadline. Faced with significant pressure to expand energy access (India) and keep power affordably priced (China), policy-makers will be reluctant to de-commission these relatively new plants anytime soon. And no less than 81% of all emerging market coal-fired capacity is located in these two nations. Adding to this, a report published earlier this month by Bridge to India, a renewable energy consulting firm, noted that there was a drastic decline in new solar power installments, and predicted that the trend could continue. In a Quartz report, Bridge to India added that of the remaining near 100 GW of India’s promise to reach 175 GW in renewables by 2022, the current rates of progress would make the country achieve only 67 GW – well short of its target. Adding to this, India’s population is expected to reach 1.5 billion by 2025 – from its current 1.3 billion – and expanding the country’s clean energy infrastructure to cater to such a booming population is definitely a daunting challenge. This is unlike what is seen in several developed countries which have chosen to forgo coal use in the next decade, because their population is not growing at the same rate as that of India. So any comparison of India’s goals and achievements with developed countries may not be fair. However, with climate change posing a real and imminent threat, this could be an opportunity for India to show the world how to migrate to clean energy on a large scale. For more stats, read the full report by BloombergNEF here.